I’ve also temporarily pointed all my robotic shed domains at this wordpress blog because they are easier to remember. At some point I need to transform this blog into a fully fledged internet site with all that fancy e-commerce and descriptions of the games I’m making. That day is not today however. This entry was posted on Thursday, February 11th, 2010 at 10:06	and posted in Games business & marketing, Site information. You can follow any responses to this entry through the RSS 2.0 feed. Its coming for your vegetables. 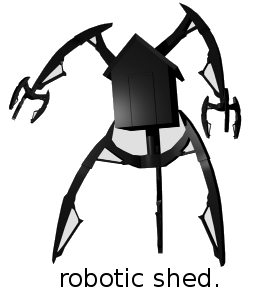 I imagined the robotic shed comically running along with inspector gadget style limbs poking out. I like the logo. Looks like you need to fill in those grey bits white.